Don’t think the plain old Jeep Wrangler is rugged enough to handle your favorite off-road trails? Think again. The hardy American carmaker is offering a new Black Bear Edition Wrangler—and this special Wrangler edition is anything but fuzzy. The Black Bear Edition is named after the infamous Black Bear jeep trail, which takes Jeep-lovers through Black Bear Pass and descends over several rugged peaks. This special edition is only available on the Sports S models of the Wrangler and Wrangler Unlimited. Consumers that choose Black Bear have the choice between nine vivid colors that help this rugged vehicle stand out on the trail. Black Bear also comes equipped with a heritage “Wrangler” hood decal, a topographical “Black Bear Pass” decal, off-road rock rails, and a standard Sunrider soft top. It even comes with an optional body-color hard top and a standard Mineral Gray bumper appliqué. On top of all those goodies, the Black Bear Edition also gives the Wrangler 17-inch five-spoke black wheels, Silent Armor tires, and black taillamp guards. In the cabin, even the most down-to-earth consumer will find comfort in the Black Bear Wrangler’s standard air conditioning, Iron Gray bezels, sport bar grab handles, and all-weather slush mats. 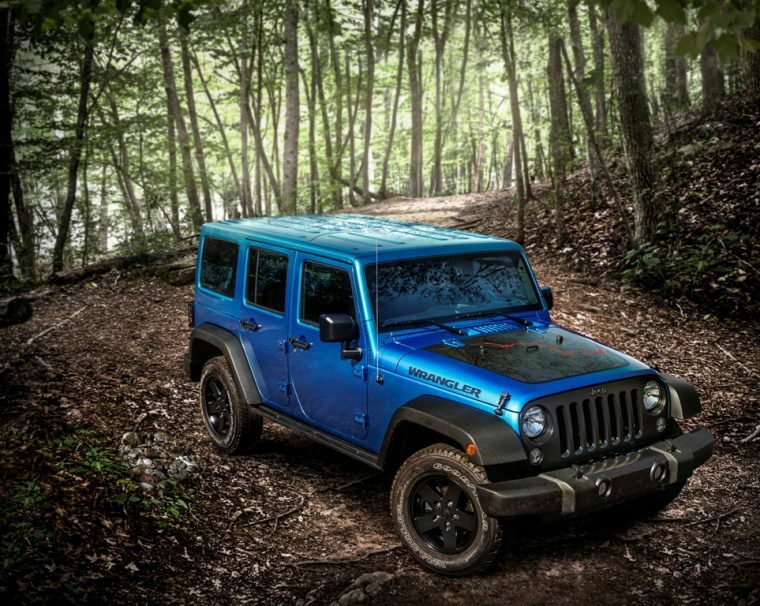 For power, the Wrangler sports Fiat Chrysler’s ever-popular 3.6-liter Pentastar V6 engine, churning out 285 horsepower and 260 lb-ft of torque. Needless to say, this is one bear of a vehicle. Henry Ford said a customer can have a car painted any color as long as it’s black. The Dodge brothers, who worked with Ford and owned stock in the company, didn’t hold to this theory of only black cars. After their partnership with Ford ended, the brothers began planning production of their own Dodge automobile and established Dodge Brothers Motor Car Company. They produced cars that were many colors, although, the 2015 Dodge Charger SXT Rallye AWD we drove over the weekend was black. The Dodge Charger SXT Rallye is not a rally car, but the “e” in the “rallye” title stands for extra appearance packages. Dodge will let you customize your Charger SXT to set it apart from all the others – or if you want a color other than black. You can max-out this four-door sedan with extras like special wheels, additional safety features, all-wheel-drive, connectivity technology, and various luxury features. The 2015 Dodge Charger is heavily updated inside and out. An eight-speed automatic transmission is now standard. The new Dodge Charger adopts a host of electronic driver aids and safety features, including a frontal collision warning and mitigation system. The Charger SXT ($32,995) we drove got a few extras from the Rallye Group ($1,195) and AWD Plus Group ($2000). That loads it up with HID headlights, heated exterior mirrors, rearview camera, parking sensors, leather upholstery, heated and ventilated front seats, power front passenger seat, heated steering wheel, memory functions for the driver seat, mirror and radio, and heated rear seats. LED interior lighting and an auto-dimming rearview mirror were included. It also had Navigation ($695) with premium audio, paddle shifters, and R/T front end/rear spoiler. Total MSRP including destination: $38,475. The Pitch Black exterior of this Charger is beautiful, but the black and white leather contrasting interior with gold stitching is gorgeous. The dash trim, gauges, and center console have a unique subtle honeycomb effect you can see in the sunlight. The front seats offer plenty of side bolstering for spirited driving and are supportive but we felt they were a bit on the firm side. The Dodge Charger is a full-size sedan and offers a very usable back seat. The attractive color scheme goes to the heated back seats that offer an average amount of legroom for adults. The sloped roof, however, can make headroom tight for tall people. There’s a handy folding center console with storage and cupholders for longer trips but we felt there was limited rear visibility due to the small side windows and raked rear glass. The 2015 Dodge Charger SXT comes with a 3.6-liter V6 engine that produces 292 horsepower and 260 pound-feet of torque. This tester had the Rallye Group and modest tuning tweaks boosted output to 300hp and 264 lb-ft of torque. As on all 2015 Chargers, an eight-speed automatic transmission is standard. Rear-wheel drive is also standard, but this SXT came equipped with optional all-wheel drive. Fuel mileage for the AWD model is an EPA estimated 18/27 city/highway mpg and 21 combined. After driving the Toyota Camry last week, we immediately noticed the Charger is a big, heavy sedan. That’s a good thing for ride quality and makes the sedan comfortable, stable, and smooth on the highway. The Charger gives the driver confidence as it feels very solid and quiet on the open road. When we pushed hard on the gas, the V6 gave a healthy enough growl as the 300 horses came alive under the black hood. The engine connects well with the 8-speed automatic and has enough power for all driving situations. The Charger SXT handled the curves well for a big sedan as we tossed it around the tight mountain corners. We did experience some body roll, as you would expect, with a full-size sedan. The AWD is seamless in the Charger V6 and runs as rear-drive unless needed, to improve highway economy. We hit the gas from a stop where there was some gravel and broke the rear tires loose. The front wheels will only be engaged if they begin to slip. We used the steering wheel paddle shifters which dials up driver engagement and proves that driving a family sedan doesn’t have to be boring. The steering feels sporty and precise. Ride quality was supple and forgiving on rutted, dirt roads. The 2015 Dodge Charger SXT Rallye AWD offers a good mix of sport and power with the 300hp V6. The Charger is a good choice for families that need more room than a mid-size sedan. It’s a balanced performer with plenty of features and options. There’s no doubt this is a Ram pickup with its in-your-face front treatment. Shown above is the Ram 1500 in Laramie Limited trim. HALIFAX, N.S. — One would think it would be an oxymoron to use the words “economical” and “pickup truck” in the same sentence. But don’t tell the folks at Fiat Chrysler Automobiles (FCA), who are touting their Ram 1500 EcoDiesel as the antithesis of the traditional gas-guzzling pickup. To demonstrate this fact, FCA Canada took us down to the Maritimes to drive a sampling of 2015 Ram EcoDiesel models and discover just how fuel-efficient they can be. After all, Natural Resources Canada fuel consumption ratings are one thing and real-world driving is another. The exercise was for four teams of two drivers to spend a half-day each in one of four Ram EcoDiesel vehicles, all with different trim levels. At the end of the two days the fuel economy numbers for all the vehicles would be tabulated to see how we fared. The drive route started in Fredericton, N.B. early on a Wednesday morning, eventually heading to the picturesque Bay of Fundy area and then to the Confederation Bridge, which links New Brunswick to Prince Edward Island. After an evening in Charlottetown, PEI, we headed to the Wood Islands ferry that would take us to Nova Scotia with our end point being the beautiful city of Halifax. It was a wonderful drive with awesome scenery, wonderful vistas, friendly locals and some challenging roads. There was quite a mixture of driving routes, but as much as possible we hugged the coastline to see the breathtaking scenery. It was a nice test that demonstrates you don’t have to have a sedan, SUV or sports car to enjoy a driving holiday in this great country of ours. A fuel-efficient pickup like the Ram 1500 EcoDiesel will do quite nicely, thank you. At the end of the day, the numbers tell the story. We visited three provinces, drove between 747.5 to 839.9 kilometres on a single tank of fuel and the fuel consumption numbers ranged from 8.6L/100 km to 9.3L/100 km, averaging 8.85. That’s almost dead on the 8.8L/100 km EnerGuide highway number from the Government of Canada and our driving was a combination of both highway and city driving. Pretty impressive numbers when you consider the size and the weight of these pickups that have a lot to offer the consumer who needs a truck for hauling or towing. And even if it’s just occasionally that you really need the utility of a pickup, with this EcoDiesel you’re not being penalized in the pocketbook. Even after two days of driving through three provinces, we still had plenty of fuel left in the tanks, enough at least for another half day on the road and more than 1,200 kilometres in total on a tank of diesel fuel. And for those unfamiliar with new breed of diesel, these aren’t the smoke belching, clattering engines of old. They are clean, quiet and smoke free. The Ram 1500 is the only full-size, light-duty pickup on the market to offer a diesel powertrain. And it has been a popular option with customers as about one in four Ram 1500s sold in Canada this year is an EcoDiesel. As you move up the trim line, as many as 50 per cent of the high-end Laramie, Longhorn and Limited models have been diesel. One wonders why other manufacturers haven’t gone this route, but FCA executives will be happy to have this market all to themselves. 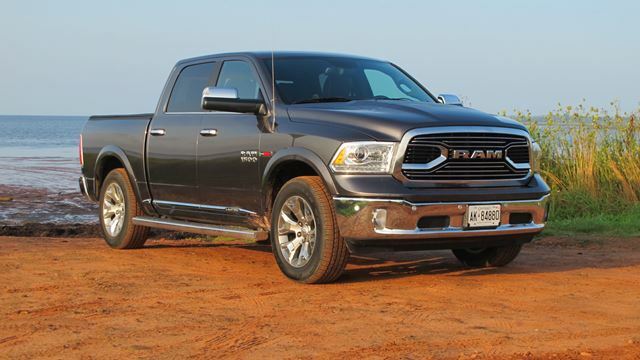 It has made Ram the second best-selling vehicle in the country and FCA’s top-selling model. At the end of August, Ram sales numbers sit at 62,487, a jump of seven per cent over 2014. While you save at the fuel pumps, the Ram EcoDiesel is not inexpensive. Prices start at $39,295 (the EcoDiesel engine itself has an MSRP of $4,700) and the engine is available on all regular, quad or crew cabs. The 3.0-litre turbocharged V6 EcoDiesel is paired with an eight-speed transmission and makes 240 hp and a class-leading 420 lb/ft of low-end torque. If you have to haul a boat or trailer, it has an impressive tow rating of 4,713 kg (9,200 lb). The engine itself is built by VM Motori, an Italian manufacturer that has been a Chrysler supplier since 1992. The company was purchased outright by Fiat in 2013. One model we tested is the high-end Laramie Limited in 4×4 Crew Cab format. It’s pricey, $71,760 as tested, but comes with all the bells and whistles like leather upholstery, dual zone climate control, chrome bumpers, heated first and second-row seats and ventilated front row seats. Four-wheel-drive is available on all trim levels and one feature that many buyers might find desirable is the optional four-corner air suspension ($1,695). With this system, the truck can be raised if you need more clearance and lowered for ease of entry and exit. At speed, the truck is automatically lowered for better aerodynamics and load leveling is also automatic. Other models we tested included the, Big Horn 4×4 Crew Cab, Outdoorsman Quad Cab 4×4 and a Ram 1500 SLT Crew Cab 4×4. There are a multitude of variations, so visit www.ramtruck.ca for all the details. The Ram 1500 is a popular choice among pickup buyers with any powertrain, but if fuel economy is your prime consideration then the 1500 EcoDiesel is the vehicle for you. FUEL ECONOMY: 12.1L/100 km city, 8.8L/100 km hwy. WHAT’S BEST: The fuel economy of the EcoDiesel of course. WHAT’S WORST: There’s a $4,700 premium for the diesel engine and $1,000 for the eight-speed TorqueFlite automatic transmission on certain models. WHAT’S INTERESTING: Ram 1500 is the only full-size light duty pickup to offer a diesel powertrain. DIGITAL EDITOR ANDREW STOY: Why is this a Dodge and not a Ram or a Jeep? Even this R/T Durango doesn’t make a ton of sense in the niche muscle car Dodge lineup these days, and it may help explain why FCA only moved about 5,500 of them last month — a month when Ford sold almost 25,000 of the similarly sized and priced Explorer. Stick a seven-slot grille on it and some round headlights, call it a Jeep Gladiator or something and watch sales triple. Jeep gets its three-row SUV, and Dodge gets … well, Dodge gets the Hellcat, and maybe that’s enough. In its current iteration, the Durango gets aggressive Ram 1500 styling, and I think that may be part of its mediocre sales numbers. It’s a … burly design, more flannel shirt and Carhartt than the assertive three-piece suit look of the latest Tahoe; I’d like to see Dodge’s male/female sales ratio on these things. One note on the exterior: Our Durango tester had some of the worst factory paint I’ve ever seen with visible ripples in the side panels and rocker-panel grade orange peel on the driver’s side door. Seating is high and firm — possibly too much so for some — and everything feels well screwed together. After about three uses of the rotary shifter, you begin to wonder why this isn’t the standard for everyone; it takes up very little space, it’s nigh well impossible to knock it into the wrong gear and it’s intuitive, at least for those of us old enough to remember the traditional PRNDL arc on the steering column. There’s good space in all three rows without too much of a climb up/over for access, making it a very usable design for its size. On the road, you’d be hard pressed to guess the vaunted Hemi lives under the hood. With 5,300 pounds to haul around and horsepower and torque peaks both over 4,000 rpm, you’ve got to put your foot in the pedal to get any kind of exciting forward progress. That also helps explain the hideous 16 mpg combined fuel economy (I saw around 15 mpg in my mostly city driving) despite an eight-speed automatic transmission and cylinder deactivation tech. If it were my money, I’d skip the Hemi and go with the excellent Pentastar 3.6-liter V6; unless you do a lot of towing, you’ll notice the extra 3 mpg more than you will the missing 65 hp. Overall, this is a good-looking truck if you’re into the 3/4-size semi thing, and it offers a ton of features for its roughly $45K sticker. I’m surprised Dodge isn’t moving more of them in this SUV-crazed sales environment. ASSOCIATE EDITOR WESLEY WREN: Slap a Trail Rated badge on this and it would make a really good example of a Jeep Grand Cherokee. Though this SUV probably wouldn’t fare too well on a trail; it would fit in better with the rest of the high-end Jeeps at the parking lot of your local mall. The loaded interior of this Durango made for an extremely comfortable road-trip experience. I made a five-hour one-way trip in this gas-chugging beast, and hopped out of the leather seats without feeling exhausted. It seemed like there was a lot of thought spent in laying out a comfortable interior: the rotary dial shifter was space saving and ergonomic, the multifunction steering wheel had video game controller-esque buttons on the back to control the infotainment system, and the seat and steering wheel would adjust to anywhere you would need it. The interior, even if a little gaudy, was probably the best part about this Durango. The downsides of the Durango are a little too obvious. The aggressive styling is inline with what the rest of the Dodge lineup, but it doesn’t seem to do this SUV any favors. It could be a selling point to some, but judging by the numbers — not many. I was also surprised by the quality of the paint. The interior was so well crafted, I feel like the outside was kind of slacked on. I’ve seen better paint coming out of used car lot body shops. The whole truck could have used a nice cut and buff to make it look like it’s worth $45,000. The actual performance of the truck was about what I expected. The eight-speed automatic can be paddle shifted, which to me didn’t make a lot of sense on a car like this — an SRT8 maybe, but this R/T didn’t have enough power for it to act like a sports truck. The AWD would make for a handy feature in a snowy climate, but doesn’t help the fuel economy: which on my trip was around the 19 mpg mark — not horrible but not exactly great. I think that the V6 would have made for about the same driving experience as the small Hemi, but would have helped save a little gas. The eight-speed Torqueflite really was the best part of this whole driveline. It worked beautifully: the shifts were smooth, it kicked down quickly, and it kept the Hemi awake. Overall, I enjoyed my time in this thing. If I were looking at buying one, I would probably skip the 5.7-liter Hemi and take a hard look at the V6 or just wait until Dodge makes a Hellcat Durango, because it looks like they’re trying to Hellcat everything. Thousands and thousands of SUV buyers choose the Jeep Grand Cherokee and after a week with one, we understand just why. In case you hadn’t heard, America has been “SUV-crazy” for quite some time now. Crossovers are replacing sedans and wagons faster than you can say “car-based platform,” and the second gas prices drop to a reasonable level, full-size SUVs are making record sales. If you’re a ute’-loving car buyer, the good news is that you’re spoiled for choice. Between all-American options like the Ford Explorer and Dodge Durango (more on this in a bit) and stalwart Japanese pseudo-wagons like the Toyota Highlander and Honda Pilot, there’s a midsize SUV for soccer moms, football dads, and everything in between. But for very good reasons, thousands and thousands of SUV buyers choose the Jeep Grand Cherokee over just about all of these options, and after a week with one, we understand just why. Our tester was equipped with the Altitude package and 4-wheel-drive, adding an all-weather sense of security and some blacked-out accents that make the G.C. downright menacing to look at. Starting at just a tick under $30,000, the 2015 Grand Cherokee gets you a whole lot of SUV for your money. Equipped with the ubiquitous 3.6-liter Pentastar V-6, it makes a respectable 290-horsepower and 260 lb.-ft. of torque, and will get 17-mpg in the city and 25-mpg on the highway. If your commute consists mostly of stop-and-go city traffic however, expect that number to be much worse than expected. The 8-speed automatic transmission performs admirably, especially in slower traffic where gearboxes with more speed can often get bogged down by all of the constant automatic shifting. The $5,805 option package adds 20-inch wheels and visual updates, power and heated front seats, and the easy-to-use 8.4-inch UConnect touchscreen interface. Our tester was equipped with the Altitude package and 4-wheel-drive, adding an all-weather sense of security and some blacked-out accents that make the G.C. downright menacing to look at. Black badges, wheels, grille, and smoked out headlights and taillights are all the rage right now, and the Altitude package delivers thoroughly. What it doesn’t deliver on, however, is standard features. The $5,805 option package adds 20-inch wheels and visual updates, power and heated front seats, and the easy-to-use 8.4-inch UConnect touchscreen interface, but key options like navigation and ventilated seats were noticeably missing. For that much change, the Altitude package under-delivers on technology. At a total price of $40,830 though, the Grand Cherokee borders on luxury SUV territory in terms of fit and finish and comfort. At a total price of $40,830 though, the Grand Cherokee borders on luxury SUV territory in terms of fit and finish and comfort. Interior space is plentiful, and the seats are some of the more comfortable we’ve experienced in a mass market SUV. Handsome faux-aluminum and wood trim give the interior a high-class look, and soft-touch materials are strategically placed to leave a minimal amount of hard plastic surfaces throughout the cabin. But enough about the interior, and on to the question you’re probably all thinking: is it a real Jeep, and should I buy one? Equipped with the ubiquitous 3.6-liter Pentastar V-6, it makes a respectable 290-horsepower and 260 lb.-ft. of torque, and will get 17-mpg in the city and 25-mpg on the highway. In regards to the first part of the question, if we look at Jeep as more than just the builder of the timeless Wrangler, then the answer is undoubtedly yes. For a midsize SUV, the Grand Cherokee feels a lot smaller than it actually is which can be quite the blessing in the claustrophobic labyrinth that is Manhattan. Turn in is light but responsive, and the Grand Cherokee can only truly be described as a breeze to drive in almost any situation. If you want sportiness, shell out for the rip-roaring SRT model, but this is a truck meant for cruising, not bruising. Another noteworthy option on the Grand Cherokee is the excellent 3.0-liter EcoDiesel V-6, which can deliver up to 30-mpg on the highway and 730-miles on one tank. We didn’t have a chance to try the off-road system during our time with it, but we’d wager that many Grand Cherokee buyers won’t either. In inclement weather though, you’ll be glad you optioned up for the four-wheel-drive model, just be sure to fit proper tires in the winter. Our only other knock on the Grand Cherokee is its noticeable lack of a third row seat. We get that Jeep is moving themselves upmarket with the G.C. and the eventual Grand Wagoneer, but for everyday use, even the most opulent customers sometimes need seating for seven. For that reason, the aforementioned Durango starts to creep back into mind, as it’s essentially a Grand Cherokee with a third row and a Dodge badge. If you want (or at least don’t mind) any of those traits, it may be smart to opt for the Durango instead. Starting at just a tick under $30,000, the 2015 Grand Cherokee gets you a whole lot of SUV for your money. Another noteworthy option on the Grand Cherokee is the excellent 3.0-liter EcoDiesel V-6, which can deliver up to 30-mpg on the highway and 730-miles on one tank. It even boasts a 7,400-pound towing capacity, which is bordering on full-size pickup truck territory. There’s also an optional 5.7-liter Hemi V-8, if you really want to let your MOPAR flag fly. Other than the lack of a third row and curious option packaging, there are very few reasons not to buy a Grand Cherokee as your next SUV.